Next post: Reedley History: Yikes, Cats! For a moment in time, step into the often invisible world of those living with hearing differences. ‘Invisible’ because you cannot immediately see that someone is Deaf until you interact and/or communicate with that person. Think about it for a moment. How many times have you passed a Deaf person on the street and not realized that he or she has a difference in hearing? In the linguistic and cultural minority of those who are Deaf, personal communication is key. The sense of touch takes on an extra added importance. A tap on the shoulder is integral to Deaf culture and commonly accepted by the Deaf and Hard of Hearing community. Don’t be afraid…even though it is counter-intuitive to the hustle and bustle of everyday life, take a moment and give a friendly tap…it’s really okay. Bronson, Deaf since birth, is the Executive Director of the Deaf & Hard of Hearing Service Center (DHHSC), headquartered in Fresno. In addition to Fresno, there are offices located in Salinas, Merced, and Visalia. Serving eight counties throughout California—San Benito, Monterey, Mariposa, Merced, Madera, Fresno, Tulare, and Kings—the Deaf & Hard of Hearing Service Center provided 26,452 services during this most recent fiscal year. Yet, these core services are just the beginning! There is so much more that they provide, from ensuring that family members can learn American Sign Language (ASL), to training the Deaf and Hard of Hearing to become job-ready, to making certain that those in rural areas have access to the same services as urban clients. Amy Martinez is DHHSC’s Visalia Client Services Specialist. The kids in this photo are from the Rivera Family (as you can see, one of the kids has hearing aids). 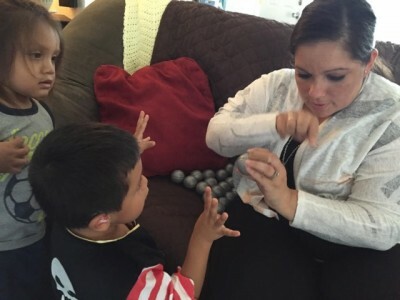 Amy is teaching them numbers in sign language using little balls to connect the concept of numbers in ASL with the number of balls. Funding for the non-profit DHHSC comes from a variety of sources and community involvement remains important. Coming up on November 19 is the 27th Annual Valley Deaf Festival, which will be held at the Fresno Fairgrounds from 10 a.m.-4 p.m. This year’s theme is “A Deaf Renaissance Faire,” and more information can be found here: www.dhhsc.org/wp-content/uploads/2016/07/Renaissance2016.pdf During the event attendees will enjoy entertainment provided by a Deaf magician, Sammy Ruiz Jr., visit informational booths, ride two large wooden horses carved by a Renaissance enthusiast, participate in activities such as archery and Renaissance-themed games, and interact with people re-enacting life during the Renaissance era as they carry out daily chores. Food for lunch will also be sold during the event. Communication will be accessible through American Sign Language and sign language interpreters. Cheryl Parreira, who is on the right, is DHHSC’s Merced Coordinator of Client Services, and she was providing advocacy services to Marion Cantaloube. Another important community event that DHHSC hosts each year is Martha’s Vineyard in the Valley. Woven into this day-long event will be pivotal communication education for attendees. Booths will feature time-period-relevant activities such as fishing, candle-making, farming, sewing, will-making, and operating a clothing boutique or a museum, and all communication will take place in sign language. This will be a trip back in time when community members, both hearing and Deaf/Hard of Hearing, were able to communicate successfully with each other, such as when Martha’s Vineyard was a buzzing community where both Deaf and hearing people lived and worked successfully side by side, and Deafness was not a barrier to participation in public life. In fact, Martha’s Vineyard’s sign language played a role in the development of American Sign Language. To learn more about the past community of Martha’s Vineyard and how community collaboration was shaped through the use of sign language, attend Martha’s Vineyard in the Valley, which tends to be hosted during the springtime, or go to the following Wikipedia site: en.wikipedia.org/wiki/Martha%27s_Vineyard_Sign_Language. Please visit the DHHSC website at www.dhhsc.org to learn about their impressive array of available options and services, or find them on Facebook at www.facebook.com/DHHSC.